Last November my friends Amy Halko, Holly Jordan and I held a Clay Wood Cloth event at MIX Garden in Healdsburg, CA. We donated a percentage of our sales to the Healdsburg Educational Foundation. The money was earmarked for the Construction and Sustainability Academy (CASA) at Healdsburg High School. 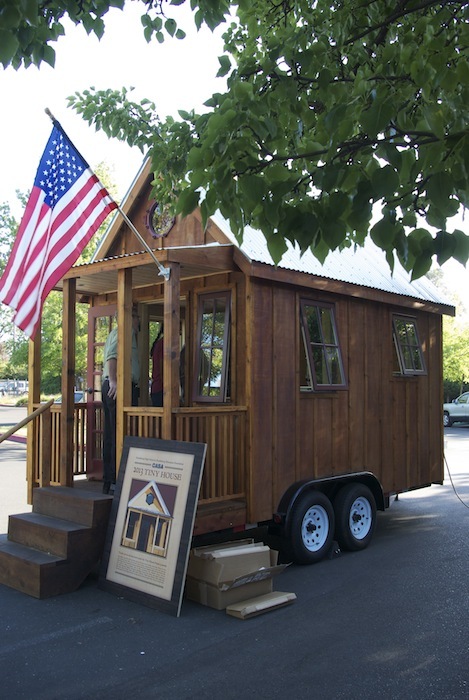 This past May we attended the Open House for the completed Tumbleweed Tiny House built by the CASA students. Standing in the 89 ft2 house on wheels, I started imagining what it might be like to live in such a small space. With all the moving I’ve done in the last eighteen months and another move on the horizon, this tiny house was very appealing. I wouldn’t have to pack or move furniture. I could take my house with me. I quickly realized though that a tiny house isn’t an option for me right now. I’d either need to rent a weaving studio or find a different line of work. Plus my yellow labs would take up most of the living room floor. But these tiny houses are a call for simplicity and sustainability. Fitting a life into such a small space requires hard choices. Each item matters in a different way because space is such a premium. As I started deciding which tea mugs I’d keep in this 4.5’ x 4’ kitchen, I realized that although my house is significantly larger than 89 ft2, I still have choices. I can still simplify. Needless to say I agree with Morris’s golden rule, although I would amend it slightly: Have nothing in your houses that you do not know to be useful and believe to be beautiful. Whenever possible let the useful items also be beautiful. Glancing around the kitchen to see how well I’ve integrated this rule, my eyes rest on the black dish drain. It’s useful, but is it beautiful? No, it isn’t. And it takes up valuable counter space. Continue using this dish drain, appreciating its usefulness. Keep my eyes open for one I do believe to be beautiful and then replace the black one. Let it go and do what a friend does – spread a Whimsy & Tea towel on the counter and carefully stack the clean dishes on the towel to dry. Were I to move into a Tiny House, I would choose the third option. But even in the house I do live in, I could choose it and appreciate the beauty of empty counter space. Letting the not-so-beautiful dish drain go would mean one less thing in the house. More importantly though, it would be a step towards living by my adaptation of Morris’s golden rule: Have nothing in your houses that you do not know to be useful and believe to be beautiful. 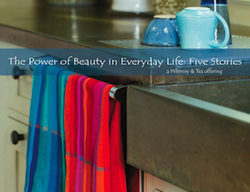 My invitation to you: If you were to take one step towards this adapted rule – having nothing in your homes that you do not know to be useful and believe to be beautiful – what would it be? I’d love to hear. Tastes do indeed change. As do styles. The idea of displaying one of your quilts over a comfortable, neutral sofa sounds lovely. May it become a reality sooner than you think! I think I saw one of the tiny home in Dwell magazine and I thought they look awfully cute although awfully small as well. I’ve always be intrigued by how to live in a small space with exactly what I need and nothing more. I remember many years ago meeting a woman who was an assistant fashion design. She lived in a tiny studio apartment maybe 350 sq feet and I was stuck by how complete and tastefully designed her space was. It seemed like most of her furniture and furnishings were in black or grey. Her clothes too. Spare as it was it still felt comfortable and spacious. I’ve always thought back to the simple elegance of this woman’s home and I feel a little embarrassed by my home and closet stuffed with things mostly that I don’t care for. It would be lovely to slowly pare down what I have to only those things I truly love and that give me pleasure. Perhaps a project for Spring 2014. Thank you for reminding me of this inspiring image. There is simplicity and beauty in most of your patterns which is one of the reasons I enjoy your work. I also meant to mention the series, “The Not So Big House” by Sarah Susanka. Sometimes I find her writing to be a bit cerebral but I love the concept and the resources she shares. The website is http://www.notsobighouse.com. Thanks, Judy. I keep learning that less is more and that there’s a real beauty to empty space. I also keep learning that paring down is an ongoing process as tastes & needs change. I think slowly is the key word! I used to assume that I would live simply and I would revel in my ability to make do with what I had. Now, at this stage of my life, I realize that I feel my best when I have space in my day to simply be, as well as surround myself with beauty and comfort. I have way too many things and stuff piled most rooms of our house, but I am reminded that I can start small with my tastes as they are now. I want to start with the living room, as this is the place people enter our home. It is also the place that is currently least cluttered, with the most useful and beautiful items, so my hope is that it will be the easiest place to start. The second room would be my bedroom. I want to wake up refreshed and ready for the day, which is not always happening now, so I know that there is some stuck energy waiting to be cleared and release, so that beauty may flourish again. So much wonderful stuff here, Marci — starting small, starting with your current tastes, and thinking about the feeling you want to create in a room. May the beauty of your space & life flourish as you take these small steps. Judy and I use 85 square feet. 55 for the Shpatzir Mobile and 40 for the Van. I would also modify the rule to include items of sentimental value, either collected while on a trip, so that it reminds me of the trip or given to me by someone in my life. Pick up just about anything in our house not work related and I can tell a story about it. Also there are other considerations, When your house moves a lot, you are better served by a stainless steel cup than a porcelain one.